What starts out in a Kansas kitchen now figures as a small part of a $100 billion dollar global industry facing serious challenges — largely because Chinese officials have decided they’re tired of being the world’s dumpster. 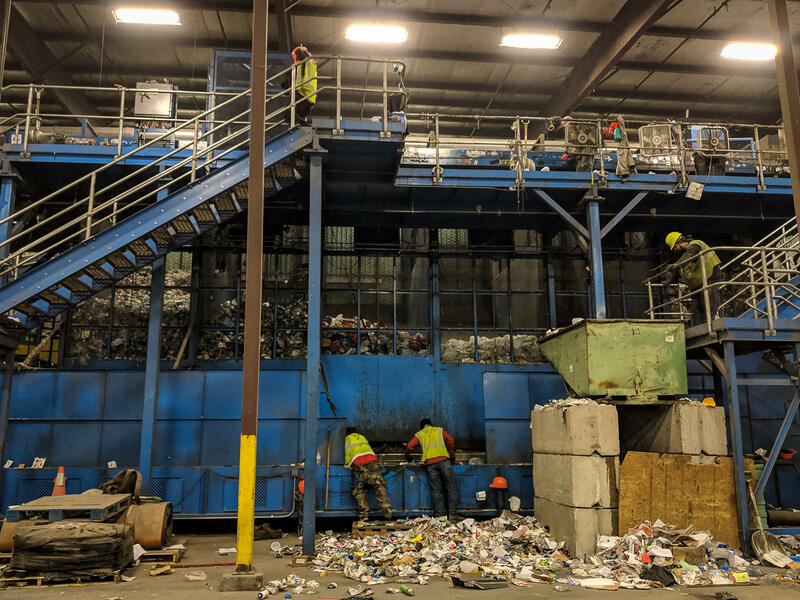 If recyclers can’t find a solution to those challenges, the convenience of putting all of your recycling in one bin might go away. That, or the plastic you put in the recycle bin will end up in a landfill anyway. From your curb to … the landfill? In 2017, people and businesses in Sedgwick County produced almost 397,000 tons of trash and 65,000 tons of recycling. Statewide, Kansans produce on average about 2.8 million tons of trash. A machine presses paper and cardboard into 2000 lb bales. The cycle starts with consumers. We eat food, order stuff from Amazon and, every once in a while, clean out our closet. Each of those activities produces waste. Some of it is trash and meant for the landfill. And some of it can be recycled, such as cardboard Amazon boxes, plastic milk jugs, and aluminum cans. In most medium to larger cities in Kansas, it’s up to consumers to separate the waste into two usually different colored bins: one for trash and one for all things that can be recycled. And a lot of people aren’t that good at sorting. A trash truck then drives down your street and picks up the trash bin, while a separate truck picks up the recycling bin. From there, the trucks usually go to the same place: a transfer station. A transfer station is essentially a large warehouse where trash and recycling trucks dump their loads. The trash and recycling, which remain separate, are then put into semi-trailers and trucked to their next destination. The trash ends up at a landfill, where its journey ends. The practice of shipping trash from one county to the next is pretty common. About half of all counties in the state do it, with some trucks traveling as far as 200 miles. As for the waste from your recycling bin, it goes from the transfer station to a recycling company. “It looks very much like trash,” said Dustin Kalp, district manager of Stutzman Refuse Disposal. And he’s right. Before the plastic is separated from the paper, and the aluminum from the glass, it looks like a pile of trash — only less stinky. From here, one of the 25 workers at Stutzman’s facility in Hutchinson uses a small skid steer loader to begin feeding a sorting machine. The machine stands about two stories tall and takes up most of the warehouse it sits in. 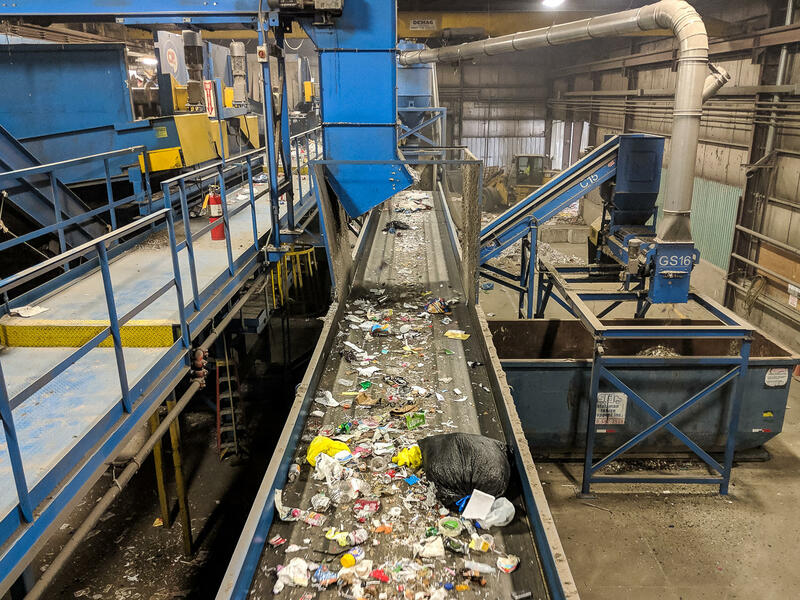 It uses a series of high powered magnets, spinning ramps, specifically sized gaps and holes, and humans to sort the mix of paper, plastic and glass into individual commodities. The humans might be the most important part. They are the first and last defense against contaminants such as diapers, shoes and plastic bags. The fight against contaminants is a big issue right now. China, which imported about 30 percent of all recycled material in the U.S. in 2016, has tightened its standard for what it will take. Government officials there have grown tired of being the world’s dumpster. 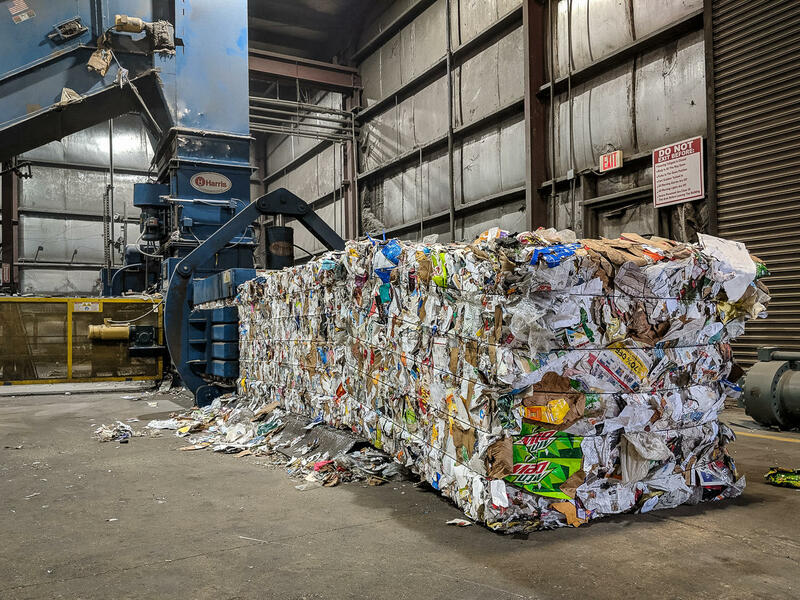 They’re also looking for bales of material that can be used to make new products right away, without having to go through another sorting process. Different types of plastic and metal are separated and sorted before being baled. For paper and plastics, a bale can contain no more than 0.5 percent contaminants. That’s something very few U.S. facilities can achieve right now. Currently, a bale of recycling from the U.S. typically contains anywhere from 2 to 15 percent contaminants. While Stutzman never sold its material overseas (it’s too far from the coast for that to have made financial sense), the tightening Chinese standards for imported materials created a ripple effect. That’s created a glut in the U.S., driving down prices. But even that isn’t enough in some cases. Recently, he’s had to send bales of plastic to the landfill because no one would buy it. That means paying to get rid of something he used to make money off of. For companies to get to the level of contamination China demands, the options seem to be spending a lot more money on better machinery or moving away from single-stream recycling. The latter isn’t likely because most Americans are used to a single-stream system and would probably stop recycling if they had to put significant effort into cleaning and separating items more diligently. But Mitch Hedlund of the nonprofit Recycle Across America thinks the solution for eliminating contamination could be even simpler. Her group advocates for the use of standardized, universal labels to go on every recycling bin. The various labels that are put on recycling bins at stadiums, offices and at homes often create confusion about what can and can’t be recycled. Hedlund contends that if all the bins had a single, standardized label (like what happens with traffic signs) people would not put as many things that can’t be recycled into the bins. In the meantime, the companies that pick up your recycling might have to start raising their prices. The city of Derby has had a contract with Waste Connections to pick up its trash and recycling since 2009. Kathy Sexton, Derby’s city manager, said it’s been a big hit. But the contract ends Dec. 1, which means the city will soon be asking for bids from companies for a new contract. 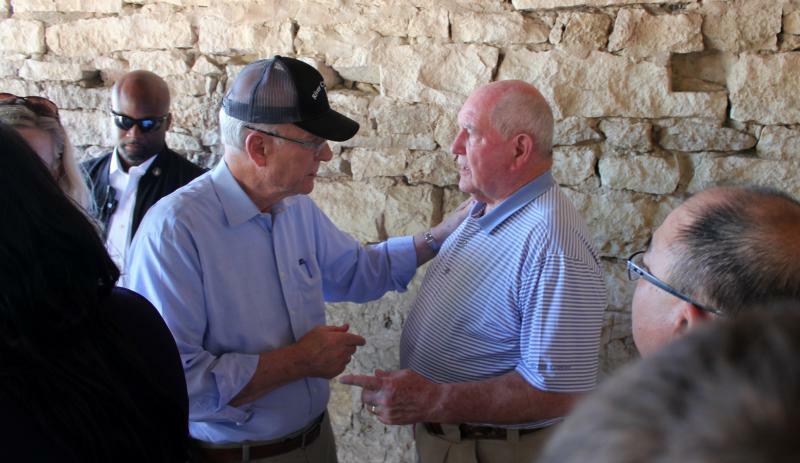 “I’m only nervous … because of this international recycling market situation,” Sexton said. Joe Pickard at the Institute of Scrap Recycling Industries said she’s right to be worried. Many companies across the nation are looking to renegotiate contracts in a way that takes into account the changing market dynamics.